Personal Customer Support - be on a first name basis with your support specialist. No touch-tone maze, just a direct line to a support specialist that is dedicated to helping you. ** Same day setup if order placed by noon weekdays Eastern Time. Orders placed after noon may be set up the next business day. Included with all of our Unix plans, Agora is an easy to use shopping cart ideal for a website of a few to a few hundred products, compatible with popular gateways such as Authorize.net, or process offline. Browser based administration, very customizable. e-commerce solution under on going development by the open source community. Its feature packed out-of-the-box installation allows store owners to setup, run, and maintain their online stores with minimum effort and with absolutely no costs or license fees involved. Instant setup on a Merchant Accounts. 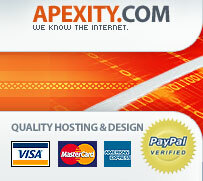 Accept credit cards today!